This area shows the advertising for pre-war electronic sets. In America, there was no public advertising for the sale of sets until 1939. Most often this material was in the trade magazines of the day. In early 1939, with the hopes of a national American launch of television, print ads appeared in the New York Times, and upscale magazines like Fortune and Esquire. Also see the 1939 GE Sales Brochure (144K). 1939 Body by Fisher advert clearly shows the 1939 RCA TRK-12 television in operation. Interesting to note the the by-line is Telecasting Tomorrow -- Today. Commercial advertising had not yet been approved by the FCC, so this shows what automotive advertising would look like in the near future! These Fortune ads are quite large, measuring 11" x 14", and do not fit on the average size scanner bed. June of 1939 -- Esquire "The Magazine for Men" (Very upscale American magazine which advertises the latest in gadgets, fashion, automobiles, clothing, jewelry, travel, etc.) Announces the arrival of "Television" to the USA. Includes a full page advertisement from RCA, for the TRK-12 television set. A partial scan of a Chrysler auto ad is also shown below --- for a price comparison. Buying a deluxe large screen (12") 1939 TV was the same price as a new car! (About $1000). Small screen (5") TV kits (you build yourself) could be purchased from about $80 (no cabinet, tubes cost $55 extra). Factory made 5-inch sets were $190 or more (with finished wooden cabinet). Click here to see the assembly manual for the Andrea television set. 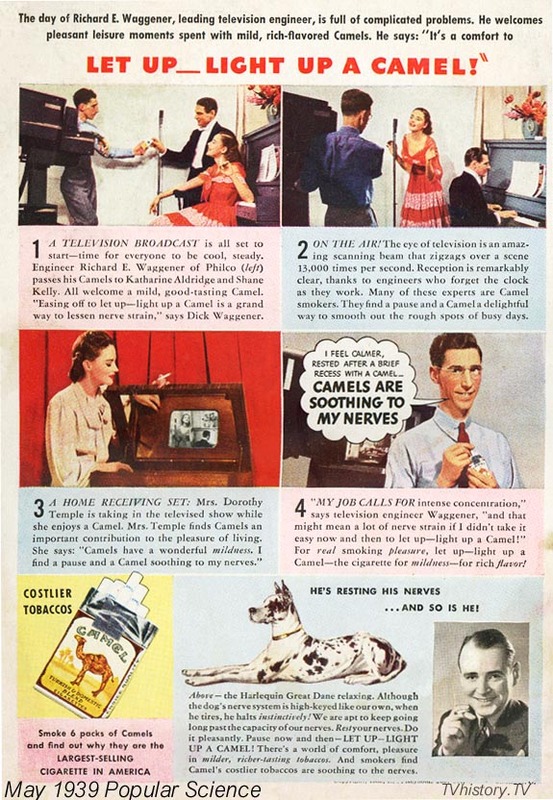 May 1939 - Popular Science Camel cigarette ad with a pre-war TV set! (100K) (376K) - Full ad, High resolution! Feb 1939 Radio & Television Magazine - Dr. W.R.G. Baker sitting in front of the 1938 prototype GE model GM-295. Feb 1939 Radio & Television Magazine - Baird 16" CRT TV at Midland School, KC - Looks like a 30" tube being stuffed in a 16" cabinet! 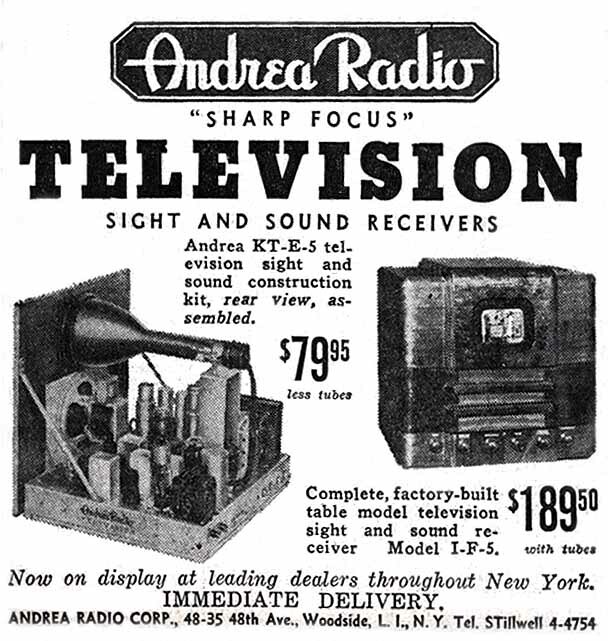 Little known to the general public was that fact that good 'ole Sears and Roebuck, in a bold marketing move, obtained several dozen 1939 RCA television sets (a few of each model), had the cabinets slightly modified, removed the RCA markings and placed a tiny "Silvertone" label on these sets. They were offered for sale in 1940 to ?, based on scant information from various collectors. 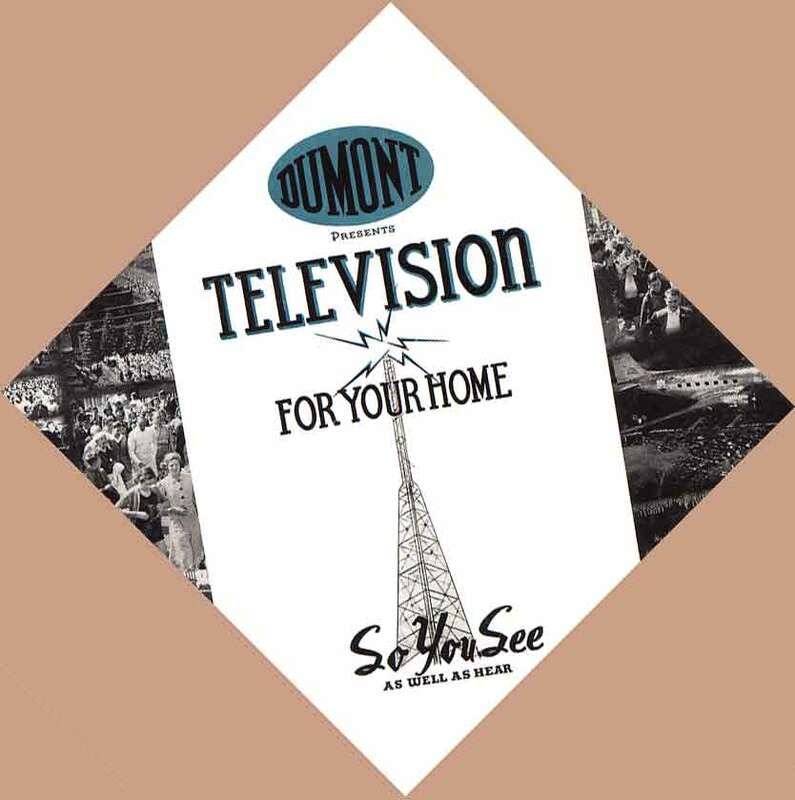 This September 1939 leaflet titled: What About Television? mentions that Sears "WILL HAVE" television sets available. (30K) Click here to see inside this brochure! Here is the front cover of an original 1939 Du Mont dealer sales brochure. Always wanting to be little different and unusual, Du Mont laid the graphics out at a 45 degree angle, so you had to twist the brochure sideways to read it! The interior pages were in standard format. 1941 Advertising - None found to date.